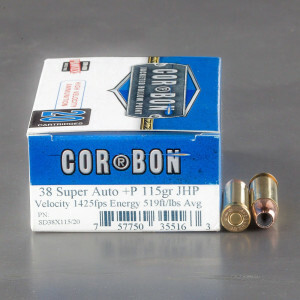 38 Super hollow point ammunition is a great choice for the pistol shooter in need of a round for self-defense. With a JHP bullet, the 38 Super is a strong self-defense round for 1911 aficionados. Overall, 38 Super ammo is a fast round and benefits greatly from hollow point ammunition. Ammunition loaded with these bullets is designed to expand on impact with a soft target, offering a larger wound channel and increased lethality. The 38 Super’s speed is still a potent factor in using hollow points, the speed and increased velocity gives the round a greater chance of opening more, and creating a larger wound channel. This expansion allows the round to rapidly lose velocity and limits penetration. This insures the round will not over penetrate and harm someone else. Hollow point ammunition is the standard for self-defense ammunition. Use this ammo in my Colt Gov. 38 Super. Fast and accurate.Reliable defensive Load. Can't stock up on enough to satisfy my needs.Recoil is mild putting you right back to your next killing shot. 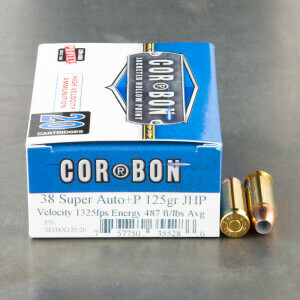 use this ammo in my two 38 Supers, a Colt LW Commander and a Taurus, when I carry either as my EDC. Reliable and recoil is mild. Got it on sale at a great price.